With two (2) optional 6 Stations Multi-Charger / Business Docking Stations! Power is the name of the game for the Motorola XTN Series™. The extra power helps to carry the radio signal through and around physical obstructions such as adjacent buildings, campus settings and multi-story buildings. At the touch of a button, the XTN Series provides one-to-one or group communication, you'll be able to respond more quickly to daily workplace issues, track your projects more efficiently, and keep up with your workforce. Additionally, every XTN Series radio offers a variety of useful features designed to keep even the busiest workforce operating effectively. Whether monitoring loss prevention at a retail store, keeping school security teams on alert or managing security at industrial facilities, the Motorola XTN Series of two-way radios provide an ideal way to help keep things running smoothly. High power levels, narrow band capability, crystal clear audio, durability and style makes this system a great long range business communications choice. The system can grow with your business; add more radios any time. The XTN Series radios are a Mil-spec feature packed current technology radio. They are totally strong and very difficult to kill. Poly-Carbonate housings are standard; typical Motorola quality that will last for years. The Docking Station & Multi-Charger system quick charges and maintains the radios and keeps them all safely accounted for in one convenient place. User programmed. User may assign any of 56 UHF business specific pre-programmed frequencies and 121 analog or digital privacy (pl) codes. Full Mu21cv, Mu24cv & XTN UHF Spirit radio series downward compatibility. Warning - If you see these system components elsewhere at a lower price it is likely very old outdated non supported stock. Be very careful not to be taken in and insist only on brand new 2006 code-dated Red Label radios; there is a huge performance difference. We sell factory fresh product with a full Motorola warranty. You get what you pay for from an authorized Motorola dealer! 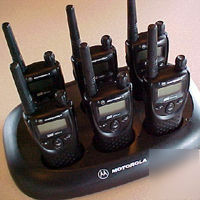 Commercial XTN UHF radios operate on assigned business radio channels - An FCC license is required for use.